Chicken drumsticks are a lot more than being the parts of a whole roasted chicken which families are most likely to fight over at mealtimes. Chicken drumsticks are fun to eat and represent a classic comfort food. Try serving them as a tasty, practical and attractive option in buffets, or pack them for eating on a picnic, fishing trip or other outdoor adventure. 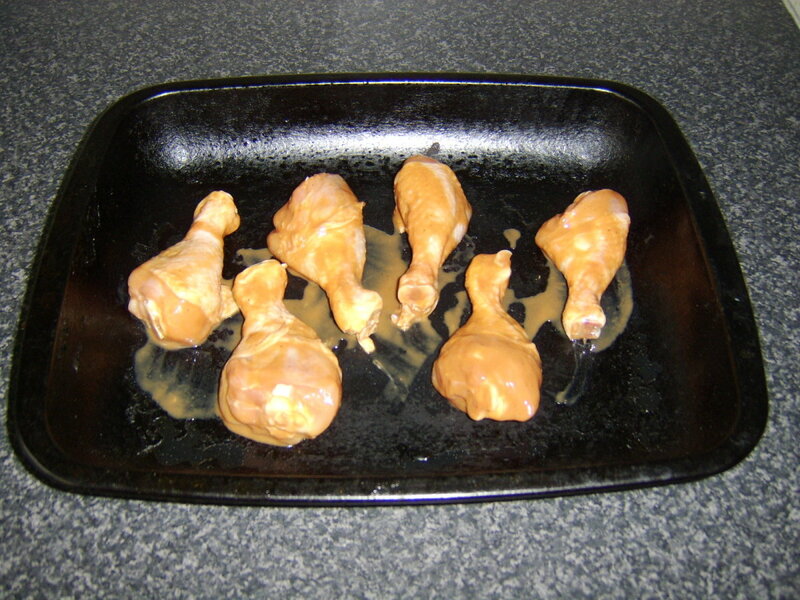 Whether you simply wish to put an end to mealtime squabbling, or are looking to broaden your culinary horizons, packs of chicken drumsticks - large or small - can be bought fresh or frozen from most supermarkets, meaning not only that there are plenty of drumsticks to go round but also that the drumsticks can be cooked and served in a whole host of different, delicious ways. Have a go at roasting the drumsticks in your indoor oven, cooking them on the outdoor grill, or even simply poaching them in a pan of water, root vegetables and seasoning. The choice is yours, allowing you to feed and delight your family as you please. 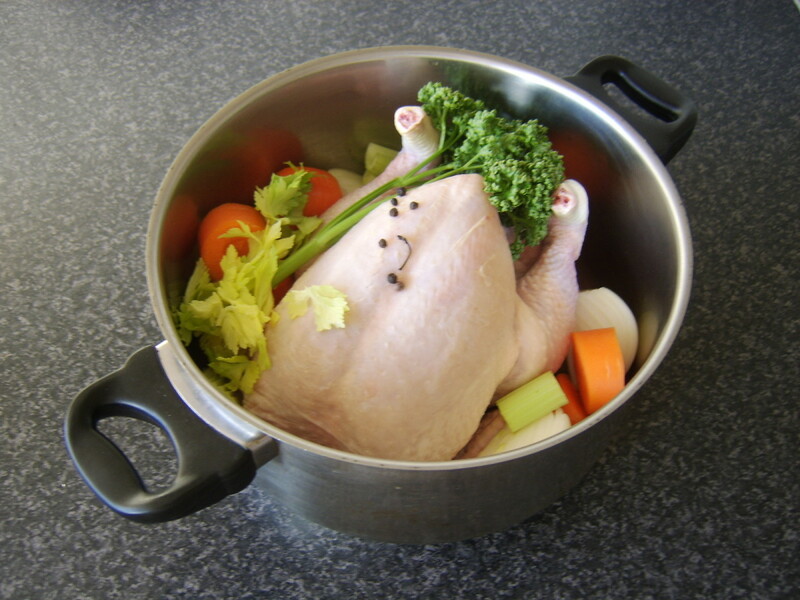 It is always worth mentioning in relation to cooking any part or parts of a chicken the importance of ensuring that the chicken is properly and appropriately cooked. Where your chicken drumsticks have been frozen, they must be thawed completely overnight in the refrigerator prior to being cooked. 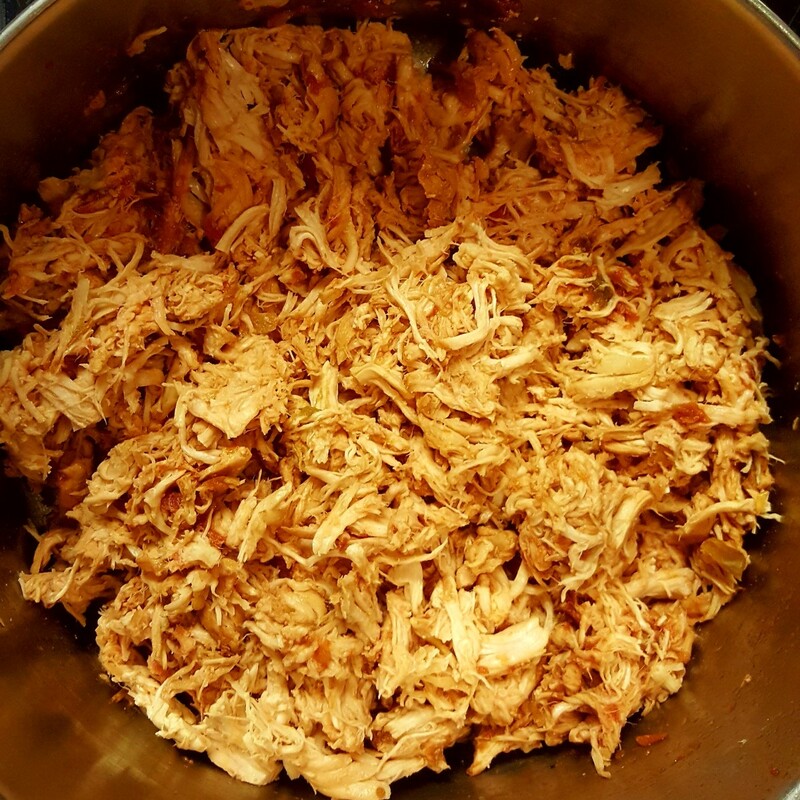 It is also imperative to ensure that the chicken drumsticks are fully cooked at all times and that no trace of red or pink juices remain. Please do not underestimate the importance of this factor. 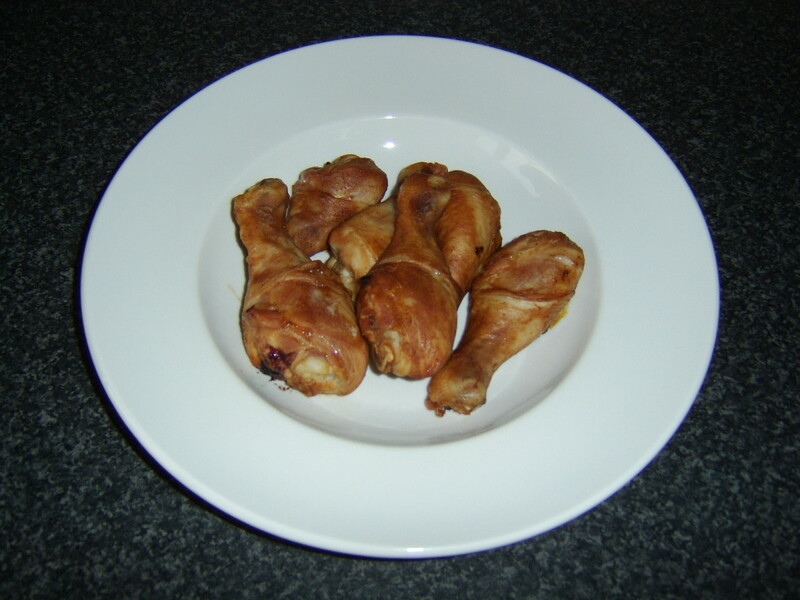 All the chicken drumstick recipes shared on this page relate to small chicken drumsticks suited ideally to buffets or picnics. Where you are using larger drumsticks, be sure to allow a longer cooking time. Hoisin sauce is a very popular Chinese cooking and dipping sauce. It is likely that even if the name is unfamiliar to you, if you are a fan of Chinese food, you will be familiar with the sweet and spicy taste. The chicken drumsticks in this recipe can either be mixed in two tbsp of hoisin sauce, or where you want to dilute the flavour slightly, one tbsp of hoisin sauce mixed with one tbsp of natural yoghurt. The mix will do 4 to 6 small drumsticks. 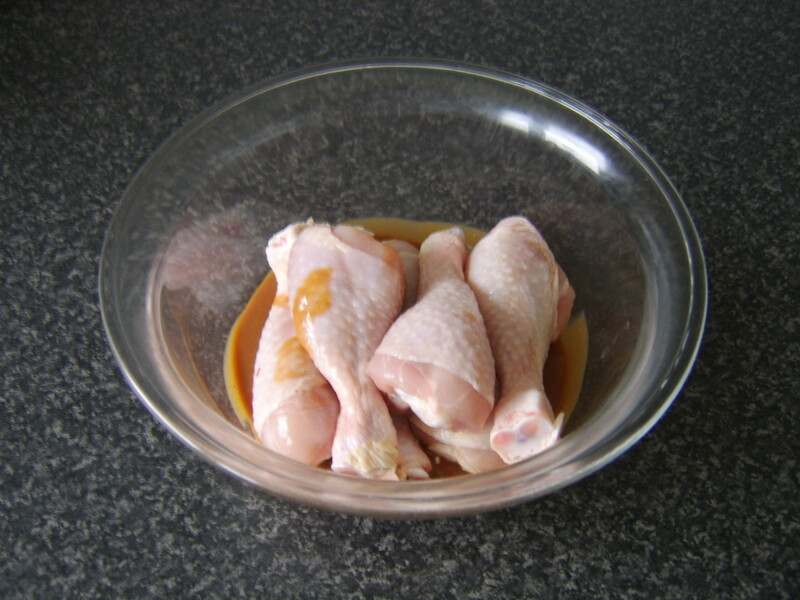 Leave the skin on the chicken drumsticks and add them to a large bowl with the sauce. Stir carefully to coat them all evenly. 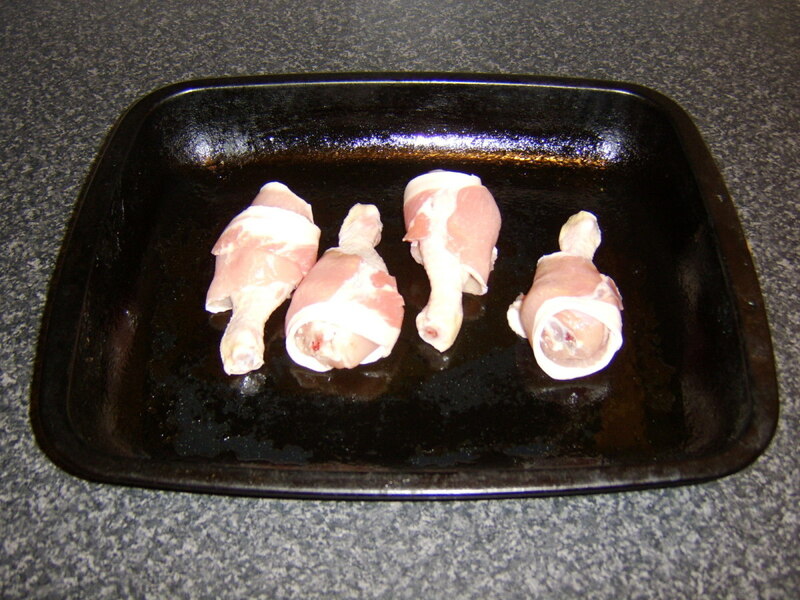 Arrange them on a large baking tray as shown and cook in the oven (preheated to 375F/190C) for half an hour. Remove from the oven, rest for ten minutes and serve. Alternatively, cover and allow them to cool completely for a buffet or picnic, making sure you refrigerate them if they are to be kept overnight. 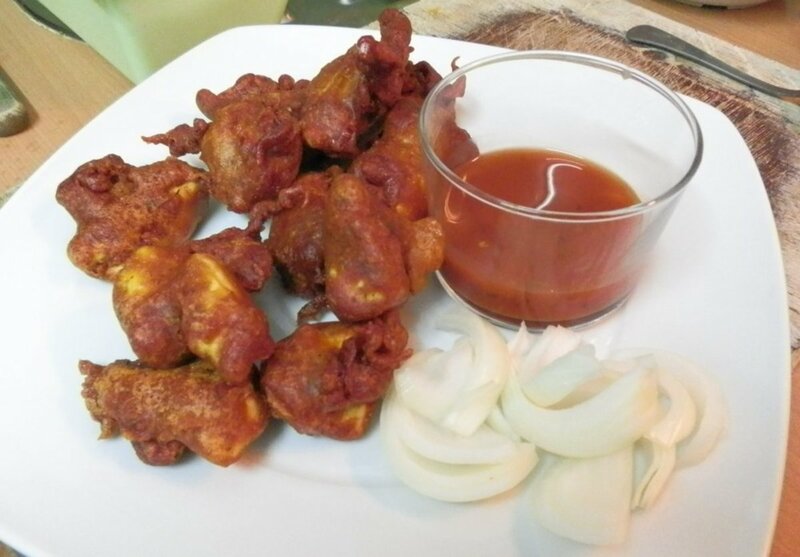 This is simply an Indian variation of the hoisin chicken drumsticks, the serving image for which is shown at the top of this page. 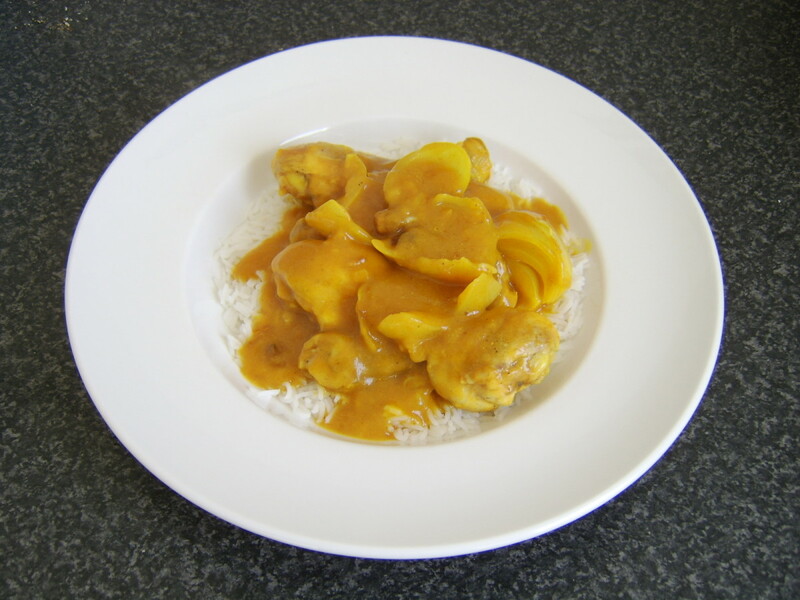 Mix the sauce ingredients together in to a smooth paste before adding the chicken drumsticks. This recipe for oven roasting chicken drumsticks incorporates no actual sauce so varies slightly from the two recipes above. 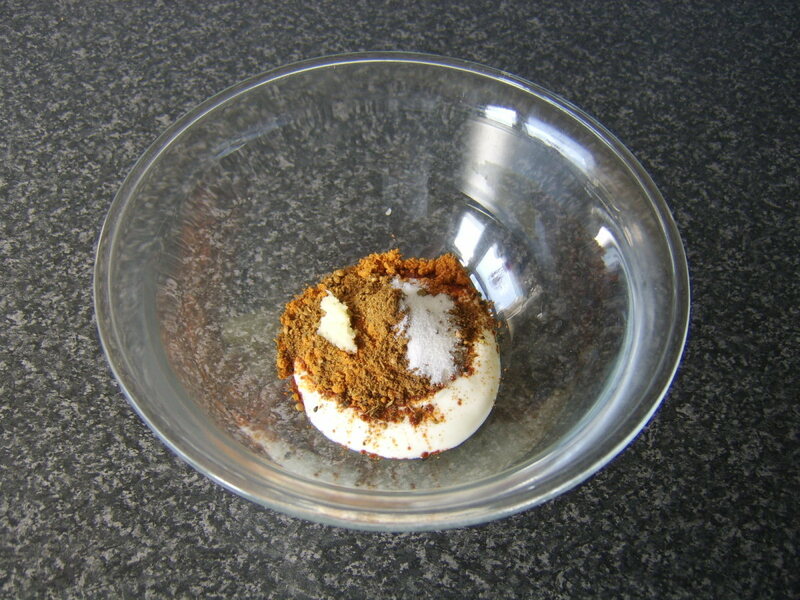 Put one tbsp of vegetable or sunflower oil in to a bowl and add one tsp of hot chilli powder and half a tsp of slat. Stir well, ensuring that there are no lumps in the mix. Add the chicken legs as before and stir to evenly coat in the seasoned oil. The oven temperature is the same, 375F/190C, but test the chicken drumsticks after twenty-five minutes rather than half an hour, when they should be ready in the absence of sauce. 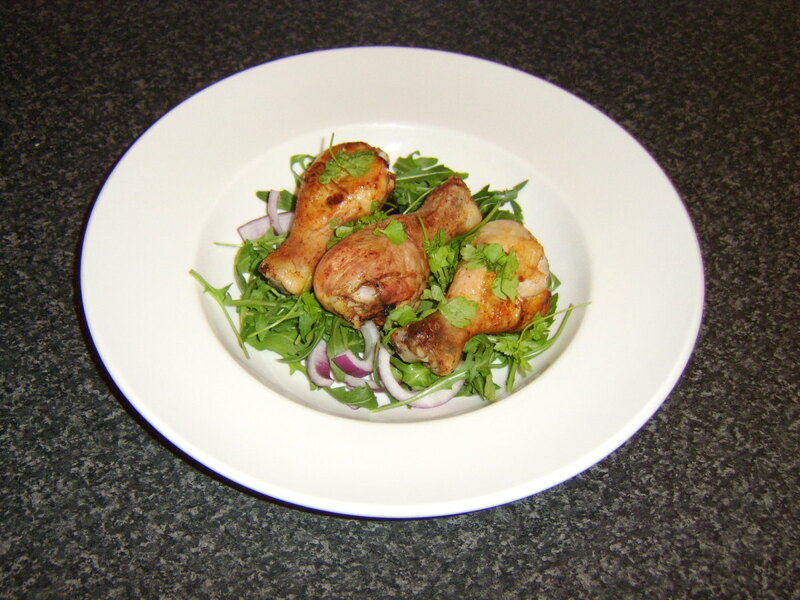 Try these chicken drumsticks served on a bed of salad, like the simple arugula/rocket and red onion salad depicted above. A garnish of some coarsely chopped cilantro/coriander makes an attractive and tasty finish. The name for these chicken drumsticks came about simply because, when you lift one to eat it, there is a certain resemblance to a lollipop. 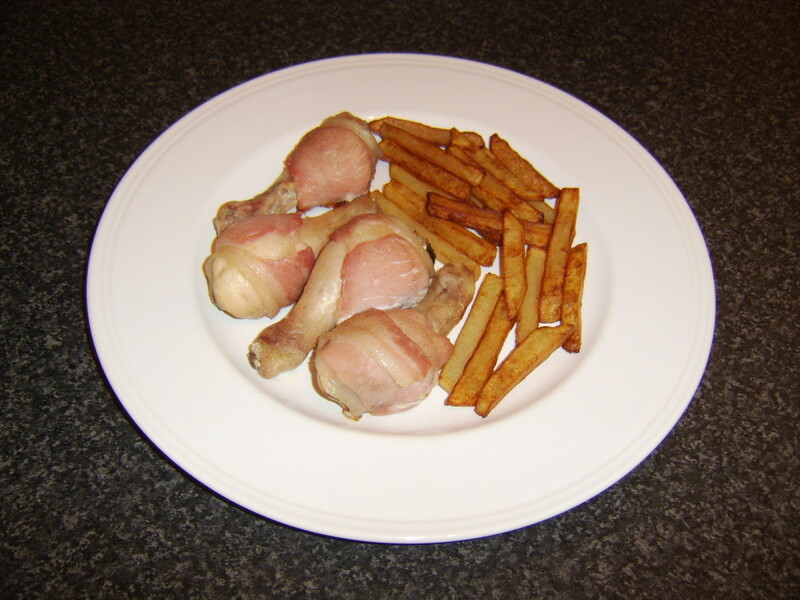 This is simply chicken drumsticks (skin on) with a rasher of bacon wrapped around the end where the flesh is exposed. 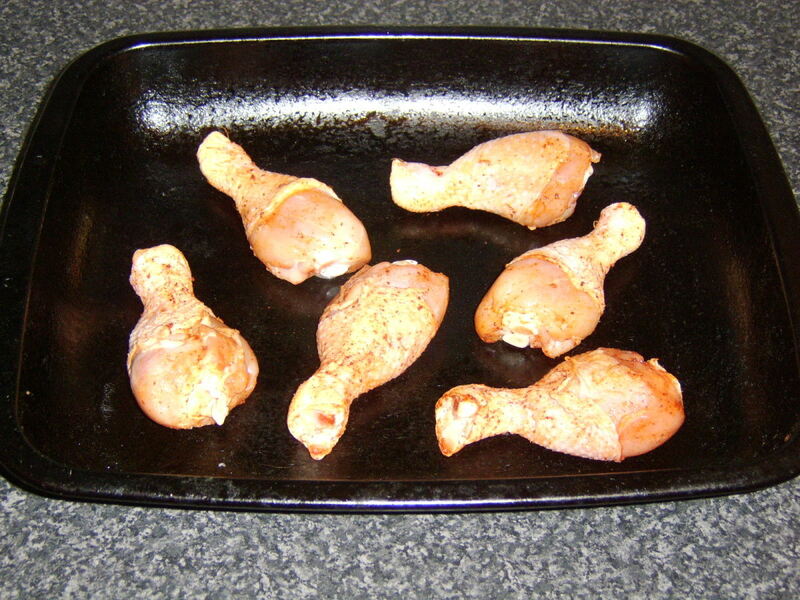 They are laid on a lightly oiled baking tray and oven baked at 375F/190C for around thirty-five minutes. You will find the bacon deliciously crisp and totally fused to the drumsticks. 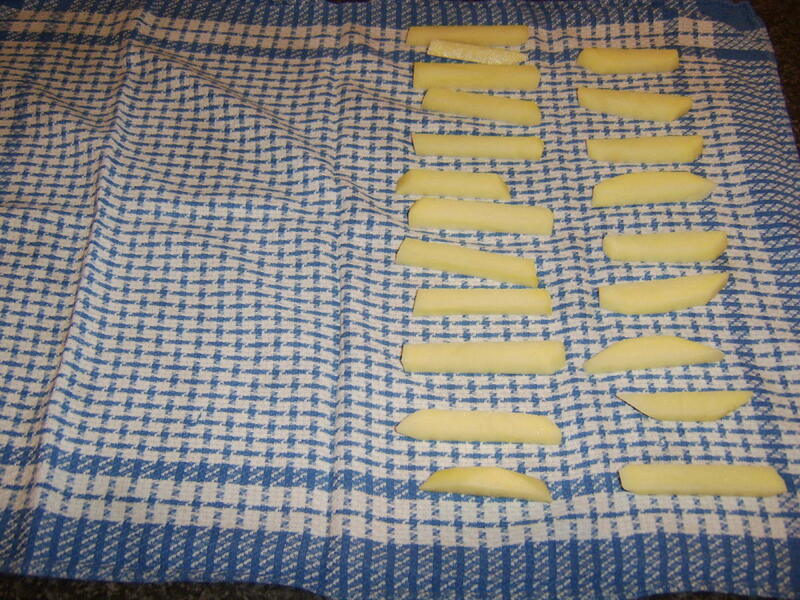 If you choose to make your own fries, simply peel a large floury potato and slice and then chop in to fries. 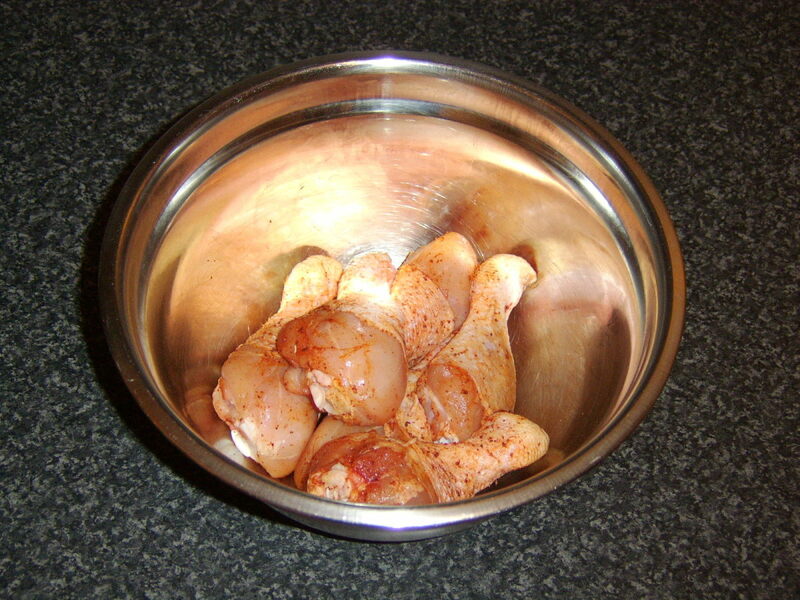 Dry them in a clean tea towel before frying them for four minutes when you put your chicken drumsticks in to the oven. 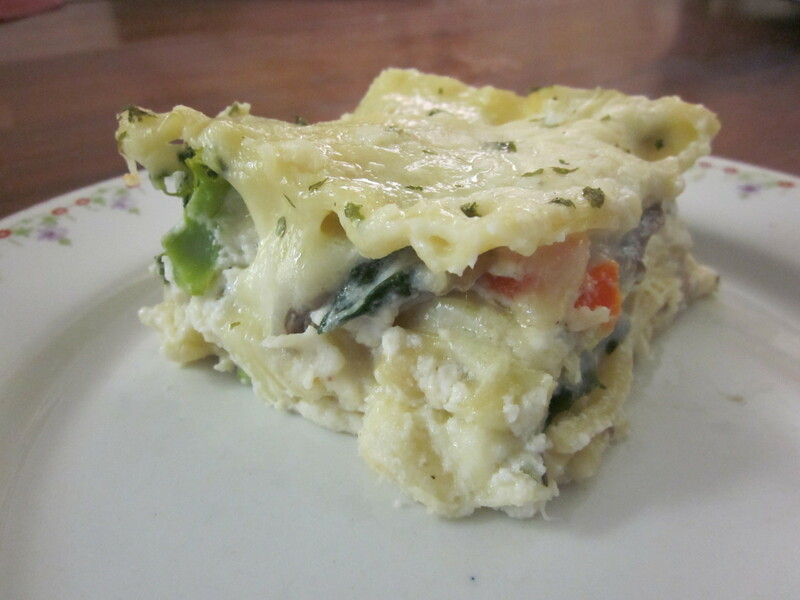 Remove, lay on some kitchen paper on a plate, cover and allow to cool. When you take your chicken drumstick and bacon lollipops from the oven and set them aside to rest, the fries should be fried again for three to four minutes until golden and crisp. 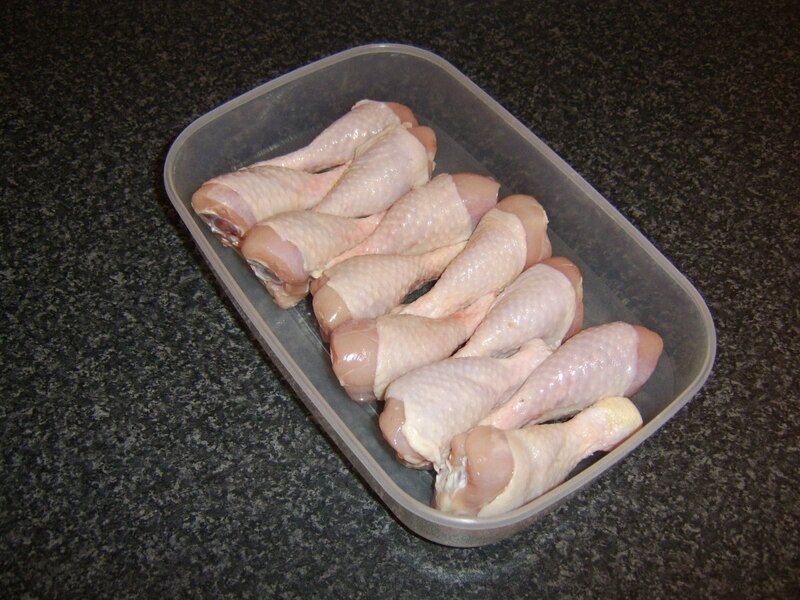 This recipe calls for the skin to be removed from the chicken drumsticks. Do not try to cut it off with a knife, as you will damage the flesh. Instead, try to carefully pull the skin from the thick end towards the thin and right off the bone. If you are struggling at the end part only, snip it away with some kitchen scissors or by cutting through it with the point of a very sharp knife. 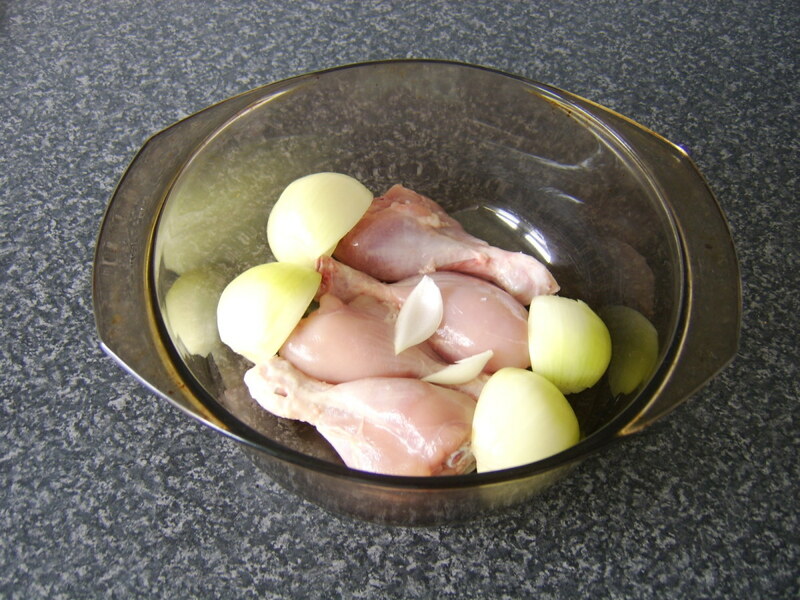 Lay four chicken drumsticks in the base of a large casserole dish and add a peeled and quartered onion. 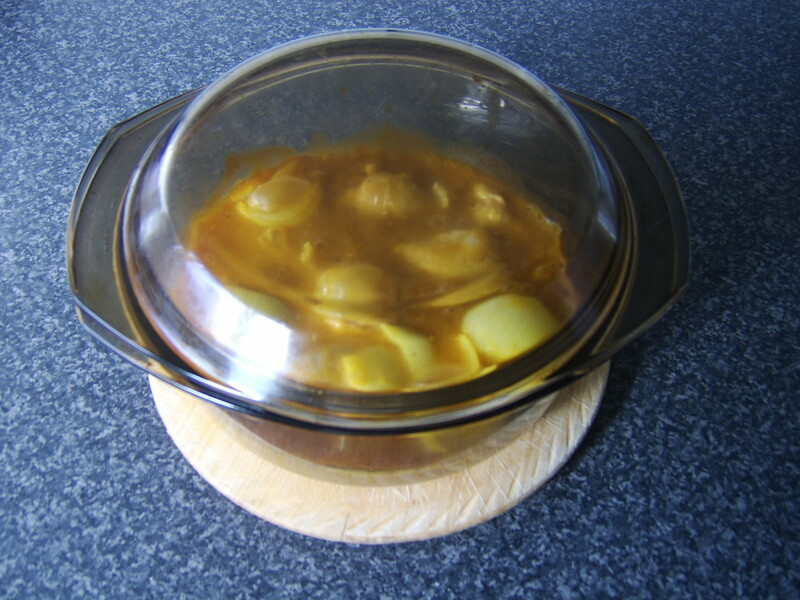 Pour over a pint of curry sauce and very gently stir to coat the chicken drumsticks evenly. Cook in the oven at 350F/180C for forty-five to fifty minutes. 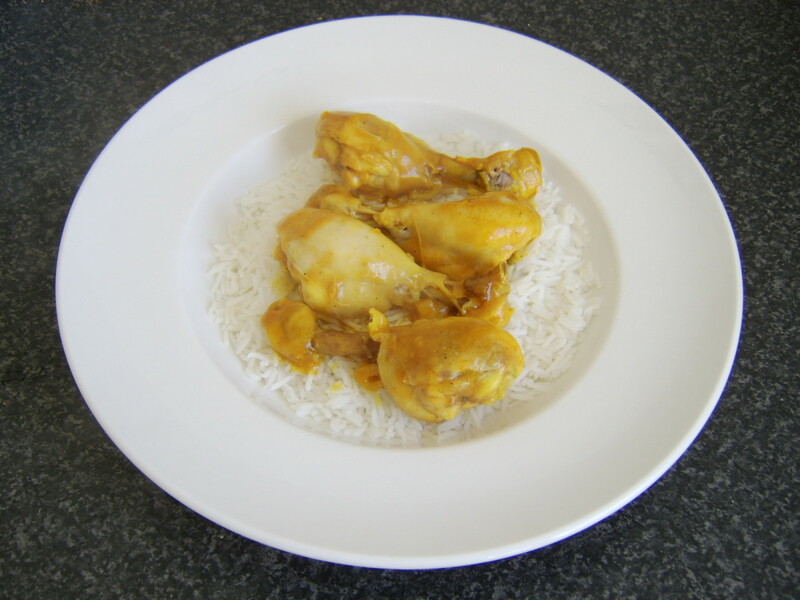 Remove and set aside to rest for ten to fifteen minutes while you prepare some boiled rice with which to serve the drumsticks. Lift the drumsticks from the casserole dish with cooking tongs and lay them on the rice, before spooning sauce carefully over the top. 5 stars from 2 ratings of these Chicken Drumstick recipes! How do you Like to Eat Chicken Drumsticks? 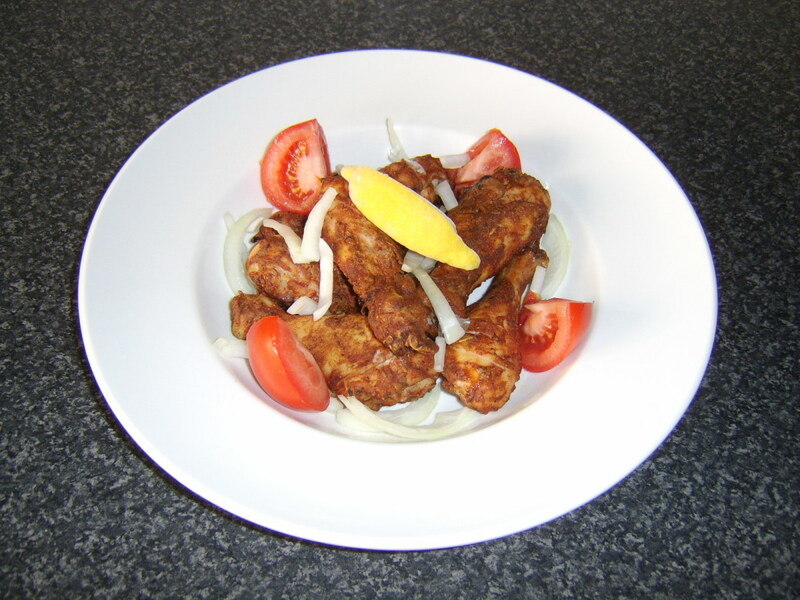 Thank you for visiting this page and I hope that you have found at least one of these varied chicken drumstick recipes appealing. I hope that you very much enjoy any of the recipes which you decide to try. Any feedback which you may have can be left in the space immediately below. Wow. this hub is simply mouth watering, all your pictures are also good. Voted up. Thanks very much Carol. I hope you enjoy any of these ideas that you try. 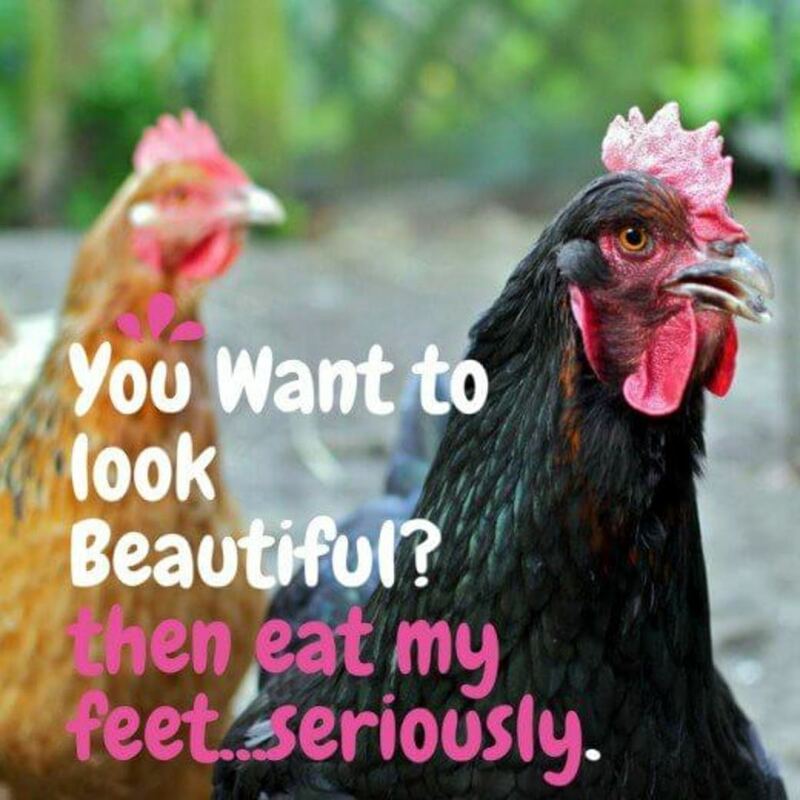 Lots of good photos and information and for one who loves chicken. Thanks for sharing all these ideas. Voted UP. Nice! I have to try the tandoori drumsticks. This can be a nice change from the "salt and spices" version I always do. Thanks, Margaret. It's my favourite part of the chicken, too. 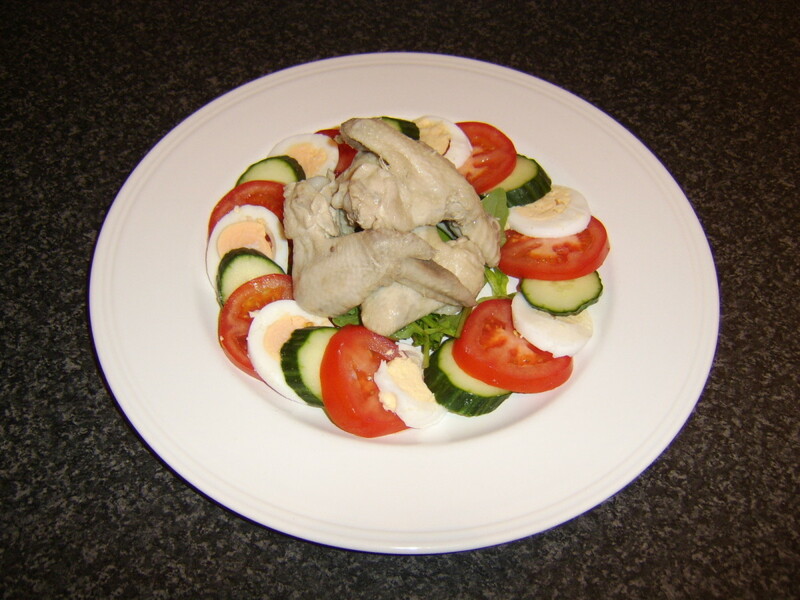 I've had many meals which have consisted only of chicken legs, cooked in any one of the ways above and more. My favorite part of the chicken. 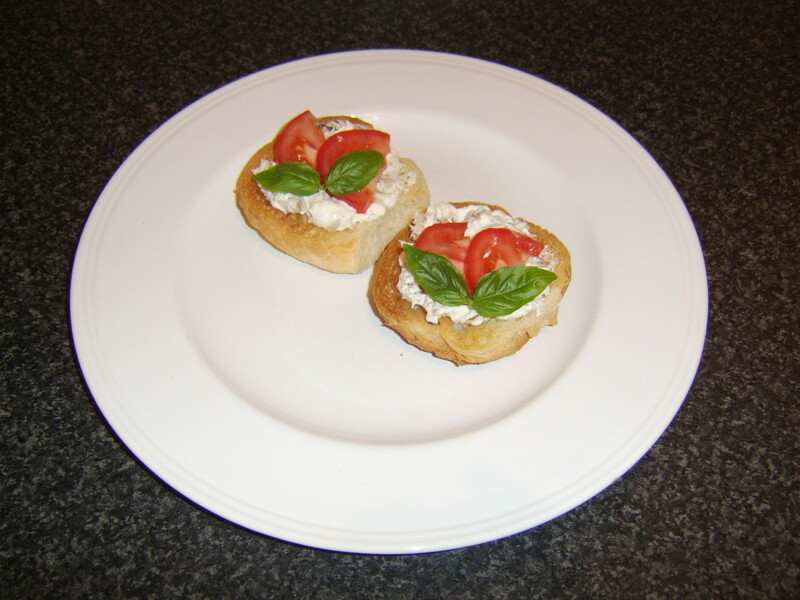 Splendid ideas on how to prepare these! I agree about the cookbook suggestion. You've done it again, Gordon! You really ought to create a cookbook of all these. Like, a printed one. Or perhaps you already have! All I can say is YUM!!!! Gordon it has always been one of my dreams to open up a restaurant. Would you come and cook for me if I ever do get that restaurant? I get so hungry whenever I read any of your recipes.